Available in standard and cantilever construction with a choice of worktops. All workstations are fitted with 4mm banana sockets and 10mm studs as standard for grounding purposes. The basic workstation will accept an extensive range of accessories, which may be added as and when required, to suit most applications. The electronics industry manufacture and handles devices and assemblies that can be very sensitive to the discharge of static electricity. A person moving around on a chair or walking across a floor can generate electrostatic voltages around 20,000 volts. Discharge occurs when static build-up in one material is transferred on contact with another differently charged material. It is this discharge that can damage electrostatic discharge sensitive devices (ESDs). Some devices are sensitive to discharge voltages as low as 20 volts. Due to the nature of electrostatic discharge it is necessary to work in electrostatic discharge protected areas (EPAs). These workstations and accessories provide such an EPA. 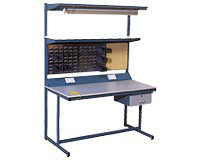 Workbenches should have earthed static dissipative work surfaces. This means that anything (which is not an insulator) in contact with these surfaces will be at earth potential by a grounding process. If metal surfaces are used, damage can occur by voltages draining too quickly. Personnel should be earthed via a wrist strap containing a 1mOhm safety resistor. Standard height: 840mm, other heights available. Powder coated finish, wide range of colours available. Worktops 20mm thick Neostat: grey, beige, or blue. ESD Laminate: grey or beige. 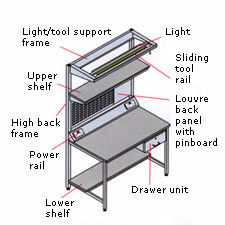 Diagram of a workshop bench. These are the base units that you can add accessories and factory fitted options to. For more information contact us by clicking here or call 01325 286689.